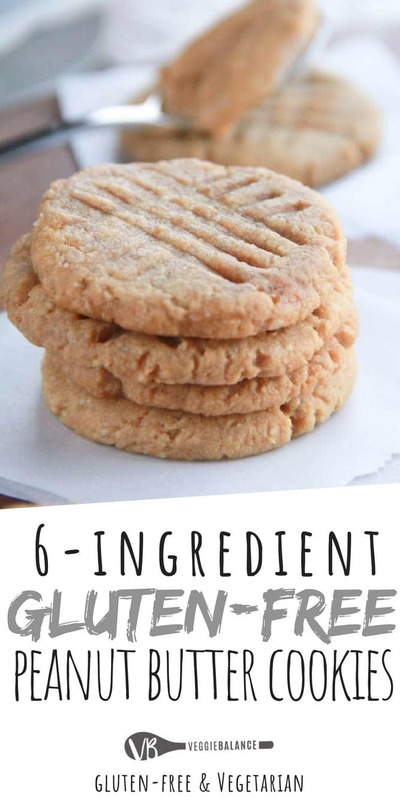 Gluten Free Peanut Butter Cookies are made with Only 6 natural ingredients. So easy to make they are dangerous. . . So dangerously good that is. Give yourself a plan, either eat some and give away the rest. Or just say fudge it I’m eating the entire batch. Your choice. 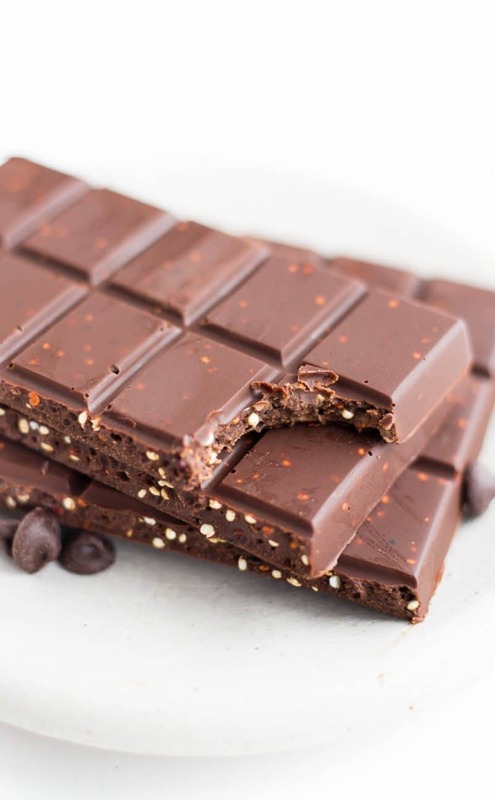 Totally packed with protein means it’s also healthy for you! 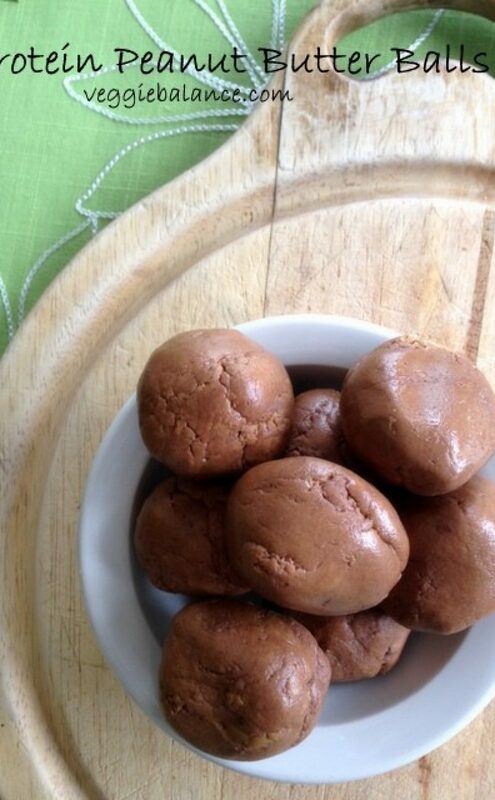 Good-for-you-Cookie + 6-ingredients = Amazing Gluten-Free Peanut Butter Cookies. It took me two batches to get these just perfectly right. 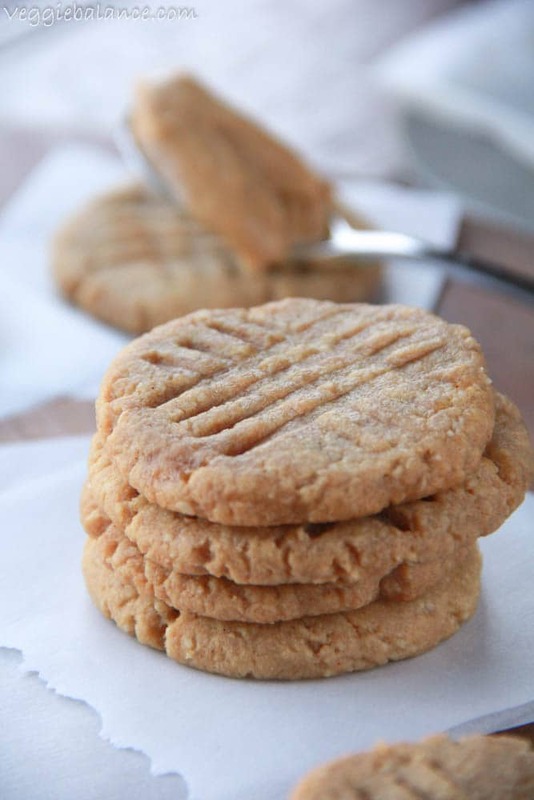 I took my good ole’ original Skinny Peanut Butter Cookie recipe and made it gluten free! Cool it down. Make sure that you allow these cookies to fully cool on the baking sheet before removing. If you try to remove them before cooling they will fall apart on you. Just be patient. Gently pat down the peanut butter dough down with your fingers before pressing into it for the criss-cross pattern. It’ll help with getting symmetrical cookies with perfect edges. See our video above for the example. Have a small glass of cold water. When you are creating the iconic criss-cross pattern dip your fork in the cold water before pressing into the peanut butter cookies. It’ll help the fork from getting stuck in the dough. Parchment Paper will be your best friend. You are more than welcome to baking on a well greased baking sheet. However, parchment paper I’ve found really helps with clean-up and makes removing the delicate cookies from the pan without breaking. No worries gluten intolerant friends (and me) we have a solution! Almond flour. Well, it’s the same answer on why I don’t make cookies very often. I eat them all. That’s my life folks. I wake up at 6 or 7am on a Sunday morning and I bake cookies. What is wrong with me? Meh, a lot. My weird obsessive baking mornings come to your advantage. 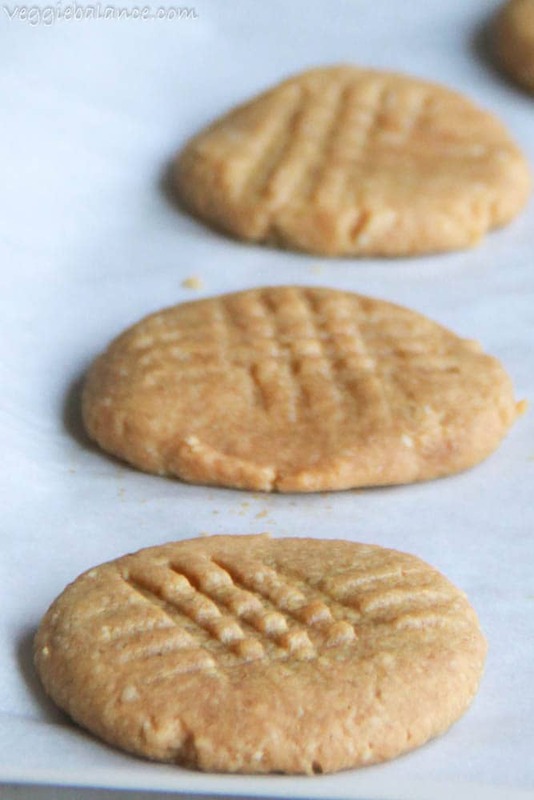 While you sleep in on the weekend (like normal people) I’m perfecting a peanut butter cookie recipe for you to make! At normal hours that is. If you haven’t heard about OMG: Oatmeal Made Great yet then go check that out. It’s my little gift to you! R’s favorite: Cookie Dough, Chocolate Peanut Butter, Cinnamon Roll. I’m now working on my next eCookbook that I’ll announce the topic of that later on. So make sure you join our Veggie Balance community to stay in the loop. Now go make these cookies. Stat! Form cookie balls with hands, about 1 inch in size each. 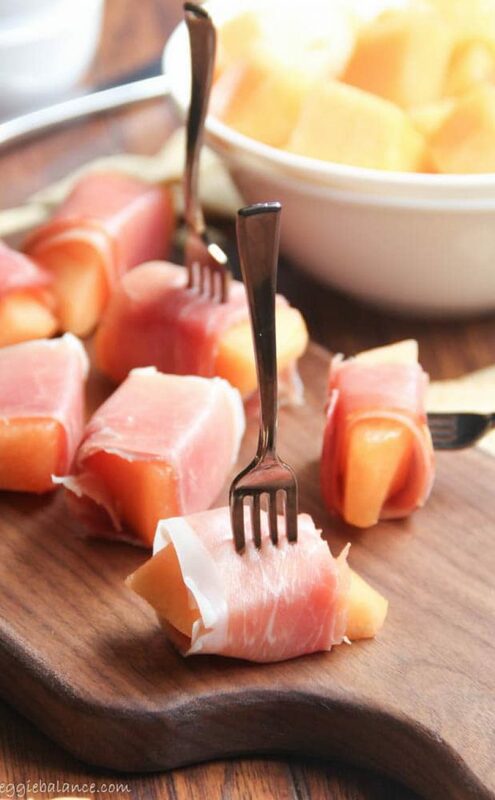 Place onto a cookie sheet prepared with parchment paper. With a fork, indent the tops of cookies with crisscross pattern. Let for 5-10 minutes on cookie sheet before removing. mm, these look delicious! I will definitely be sharing these with my celiac/gluten intolerant clients! Aww thank you Heather!! They are yummy for everyone all diets too 🙂 They’ve become my absolute fav! Yeah, I’d eat these ALL too. Dangerous and delicious :). But I don’t think they’re paleo. Can I try using 1/2 cup of PB2 and add water to the mix instead of regular peanut butter? I have like 6 jars sitting there! I haven’t tried it that way before but don’t see why not. If you do use PB2, add a little extra water than normal to make sure it’s not a thick peanut butter paste, you want it to be a creamy texture. Can I use 1/3 cup of my gluten free flour mixture instead of the almond flour? I just made these with the almond butter and they came out wonderful!! I will definitely be making them again 🙂 I used the almond butter from Costco. Hi Mona, I have the same almond butter mmm can’t wait to try it. I doubled the recipe and the mix is too creamy to form into balls. So I added a pinch more of flour and am sticking it in the freezer to try and make it harder. We will see how this goes. Hope that did the trick! The batter definitely should not be too creamy to form into balls.. why type of peanut butter did you use?? Hi Lou! So I’ve not attempted this before but I can see if you make a flax egg substitute this MIGHT work. 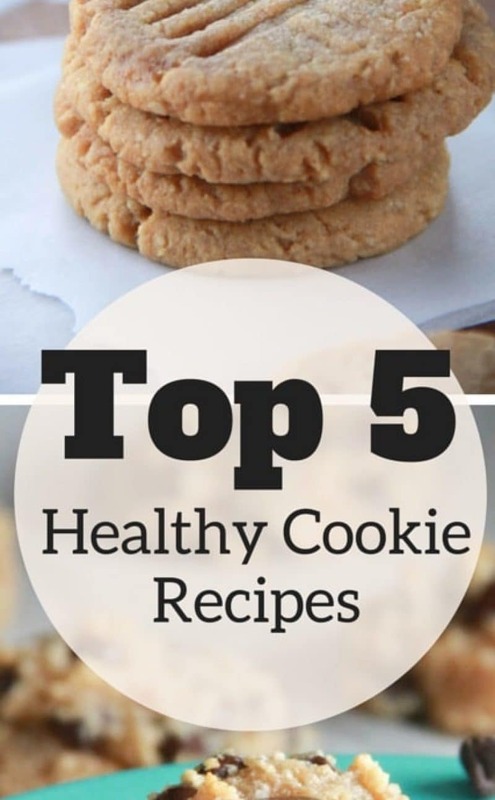 I’ve added flax eggs to other dishes but have not tried it with these cookies. If you aren’t familiar with flax eggs they are 1 Tablespoon ground flax seed + 3 Tablespoons water. Mix together and let it sit for 15 minutes in the fridge before using. Onto the oat flour. 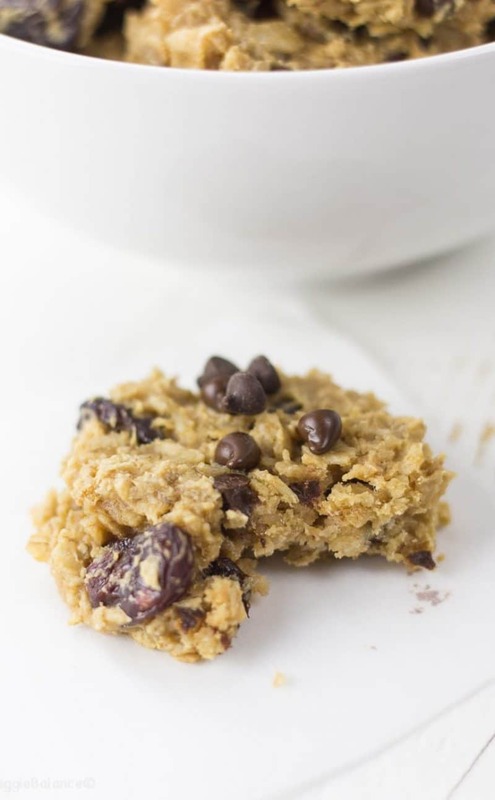 If you use oat flour the consistency will be different BUT combined with the flax egg I could see this being beneficial to help them stick together easier. Thanks a lot! I had thought of flax/chia egg but I’ve always used it to replace a whole egg, not just the whites. I baked these today and they turned out pretty tasty! However, I did not use almond flour and instead used Trader Joe’s all purpose GF flour mix. The cookies ended up being pretty dry, and a bit too crumbly. I do not see others having this issue so I suspect it must be the TJs flour. Next time I will try almond flour! All in all, it turned out well for a GF cookie with just a few ingredients. Hi Emilie! Thanks for coming back and sharing! Yes, GF flour works very differently then almond flour. Many times you’ll think the batter is not the right consistency before baking, but that is ideal with GF flour as it dries out mega times while baking. I haven’t made this recipe in a while (maybe I should though because I want some cookies! ), but I’d suspect if you brought the GF content down to 1/4-1/2 cup it could help. Oh! And it is also very important to make sure you are measuring out the GF flour right as I explained how-to and why in a recent post. 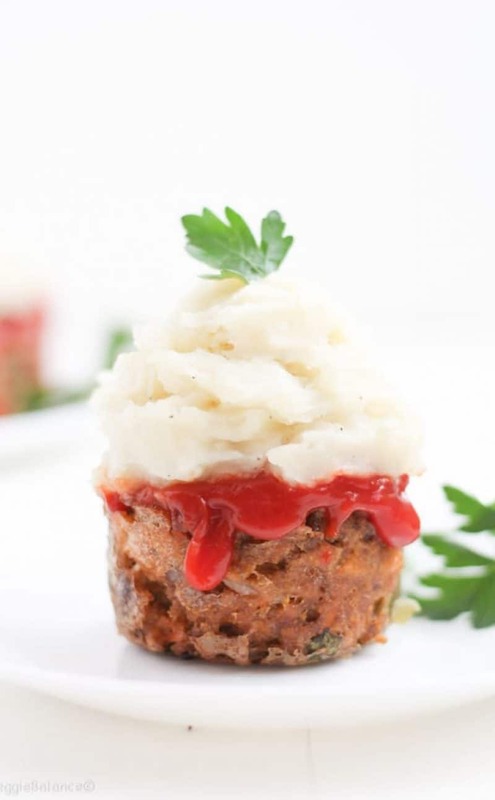 Could I use coconut flour as a substitute for the almond flour? I was wondering if this dough would work in the Pampered chef Cookie Press? Honestly I’m not really sure, I’ve never used that before. Is your concern the cookies sticking? Have you ever tried a lower carb sweetener than honey? I was wondering about substuting the honey. 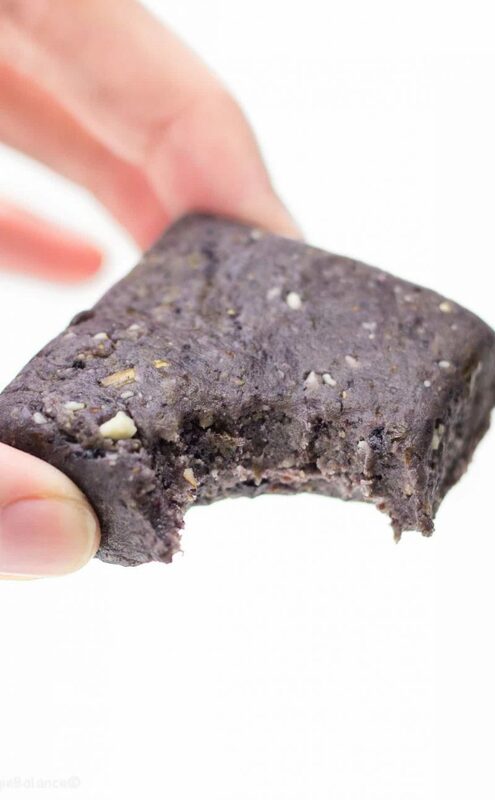 I’ve tried these with agave nectar before and they have turned out great. Any other sweeteners I have not tried, whatever you end up trying just make sure it has a decent amount of ‘stick’ to help keep the cookies together and moist. Hope this helps! Is it ok to make this without the egg? Thank you! I’d use a egg replacer, it really does need the egg to help bind the ingredients together. Hi Lindsay! I am going to try baking these for my mother in law who is gluten intolerant. Would it be okay to use regular granulated sugar instead of the honey? If so, how much? Thank you! You know surprisingly I’ve never tried this with granulated sugar! I would think you’d perhaps need to double the amount of sugar, but I’m a little unsure how they will hold together this way. It’s definitely worth a try though! Thank you for the response! Ill experiment with it a bit, but knowing my mother in law she will love it just the same with honey if the granulated sugar doesnt work out. Love how these sound. I’m looking forward to trying them. Now I’m going to be incredibly picky. 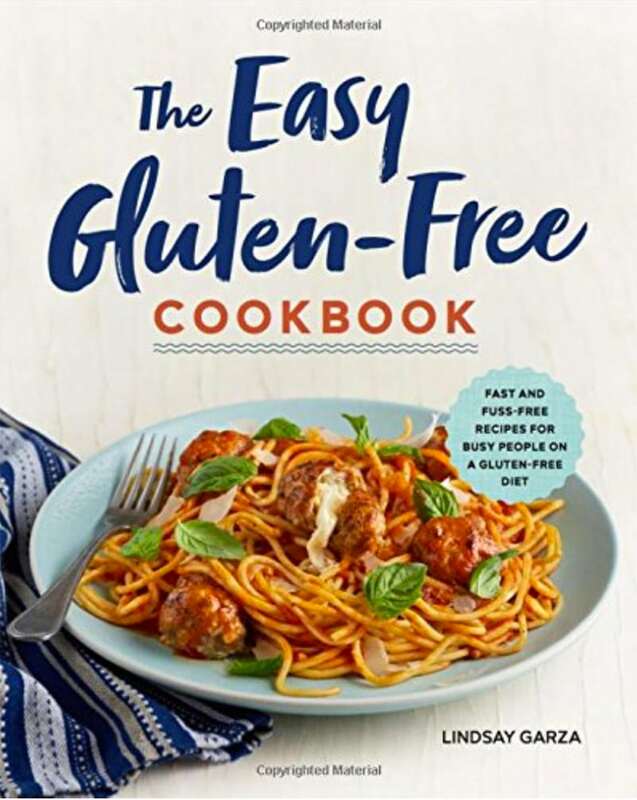 I get it that we love recipes with just a few ingredients and frequently don’t even want to look at one that has a dozen but to say it has 4 “natural” ingredients seems just a wee bit untrue. Yes, two of the ingredients are non-natural but I’d have been far more impressed with seeing it has 6 ingredients. Since no one else has mentioned it, I’m guessing I’m being cranky but still wanted to mention it. Lindsay, I want to make these tomorrow, but have a ? I use natural/no sugar organic PB and I’m wondering if that’s creamy enough. It’s definitely not the same consistency as like the Jif PBs out there. My husband likes his peanut butter cookies crunchy. I usually over cook them to get that crunch. How do you think these cookies will respond to over cooking? (Sorry if that is an offensive question). Also, I’m interested in clean recipes, but skinny is not necessary. What do you think about adding the whole egg? 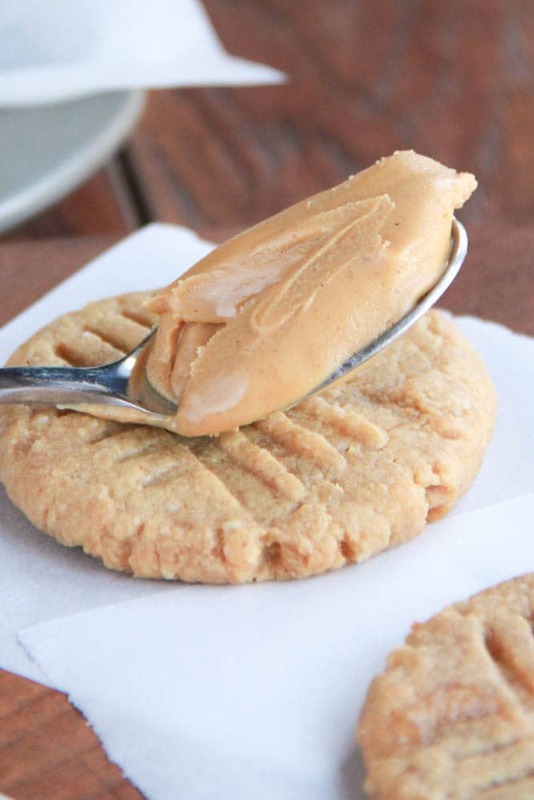 Do you think that would help binde the cookie especially using natural creamy PB? My cookies turned out a little brittle. Is it because of the peanut butter? Mines a little oily. If there is too much oil (natural peanut butter especially) they will definitely turn out brittle. I always recommend to use a decent amount of honey to even it out and that should hopefully help. Hi there! I made these last night and they turned out great but I’m not sure if they’re undercooked. I’ve never used almond flour but I followed the direction carefully with granulated sugar. I baked them for 8 minute at 350. What texture should I expect? The recipe listed is not the same as the video. Which is correct???? Can you make it with chunky peanut butter? I personally have not had the greatest luck with them turning out with chunky peanut butter. I highly advise against using your hands to form the cookies! Spray pam on a ice cream scooper and use that. I also suggest adding a pinch of truvia brown sugar and sprinkling Himalayan salt on top o fthe cookies. This looks so good! Are they very crumbly? They will be crumbly coming right out of the oven but as long as you wait for them to cool they’ll be the perfect cookie. Mine were super sticky. I couldn’t roll the dough into balls so they are just blobs on the cookie sheet. Will see how they turn out. Huh – sounds like there might of been a measuring error. Generally they are a little sticky but definitely able to roll into balls and then flatten with a your hands. To me it sounds like either the almond flour was measured incorrectly OR the almond flour you are using might be a little more course and therefore unable to absorb the moisture. Hope this helps and if anything hope they turned out alright! I love your site, but please consider changing your font, at least for the comment section. The font is so light and small and very difficult to read. Hi, I tried this reciepe and along the way was taste testing (which tastes great) however after baking my cookies seem to have a rubbery consistency (Almost pancake like) I’ve never attempted gluten free or baking with almond flour so I’m not sure what to expect. Mmm rubber/pancake consistency is definitely not would I would of referenced it too so I’m not quite sure what it could of been to turn this result. The cookies DEFINITELY will not be like you are use too and it is best to allow the cookies to fully cool before removing from the baking sheet after baking because they are rather delicate until cooled. 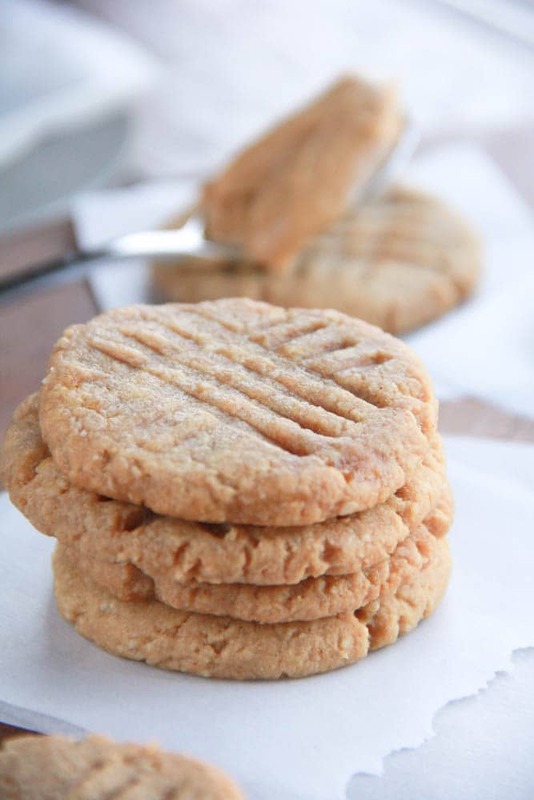 Once cooled though, they are hardened like a normal peanut butter cookie…. Any suggestions on the ideal storage for these? Countertop, fridge, or freezer? I used homemade almond butter and pure cane sugar, and they turned out great! I doubled the recipe used 1/2 coconut flour and 1/2 almond flour ( had to double flour measurement) also used 1/2 almond butter and 1/2 regular peanut butter. 350 for 7 min. Let them cool for 5 min. They are fantastic. My boys love them . These cookies I couldn’t even form into a ball in my hand they were way to gooey and creamy. I feel like it’s missing something. I used the exact ingredients. I will end up throwing this in the trash. Mmm it sounds like your peanut butter has quite a bit of oil in them. Was it natural or more natural-ish peanut butter by any chance? I substituted maple syrup for honey but my dough is too running to make into balls: Any way to save this dough? would refrigerating the dough or perhaps adding more flour help??? 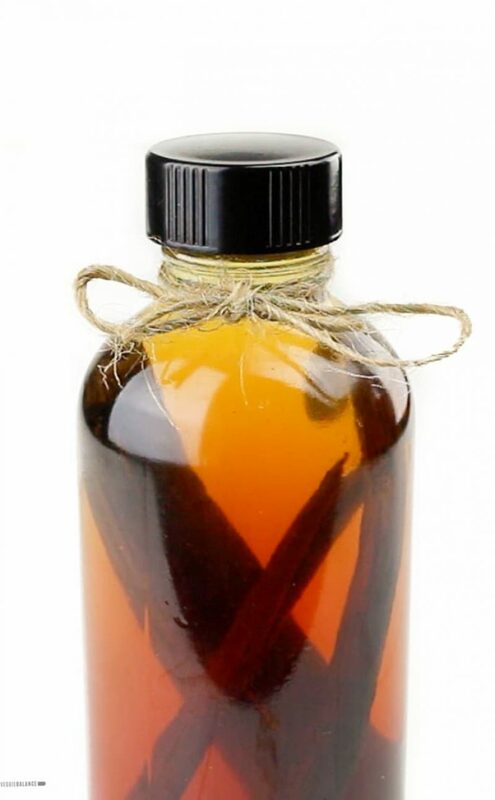 Maple syrup is really not a good alternative for this. I don’t think you will be able to salvage it. We recommend honey or agave nectar for this recipe for that reason. Just a pinch for taste.